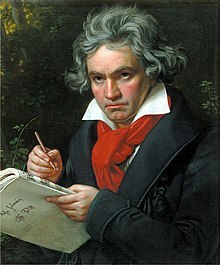 Ludwig van Beethoven wis a German chiel that componed muisic. He wis born in 1770 an dee'd on 26 Mairch 1827. He componed clessical muisic for the pianae an hale orchestras. His weel-kent warks is his fift an nint seemphonies an the pianae piece 'Für Elise' forby. He is conseidered ti be ane o the verra finest clessical componers. Whan he wis a younker he wis a talentit pianist, weel likit bi the rich an important fowk in Vienna whaur he bidit. Houaniver, in 1801 he stairtit tae growe deif. His deifness became waur an bi 1817 he wis stane deif. Atho he coudna play in concerts onie mair he keepit on componin, an at thon time componed some o his finest warks. He flittit ti Vienna in 1792 an bidit thare for the lave o his life. He niver mairiet. He dee'd on Mairch 26, 1827 (agit 56) during a thunderstorm in Vienna, Austria. He wis very famous chiel that componed pianae an orchestra classical muisic. Wikimedia Commons haes media relatit tae Ludwig van Beethoven. This page wis last eeditit on 18 Dizember 2018, at 10:49.